An epoxy resin is injected into the crack via special ports. Rhino Carbon Fiber. Install injection ports: Surface Ports (short rigid-plastic tubes with a flat base) serve as handy entryways for getting the repair material into the crack. They eliminate the need to drill into the concrete, reducing labor time and cleanup. The base of the port is placed directly over the crack and bonded to the surface with an epoxy paste. A general rule-of-thumb is to space the ports an inch apart for each inch of wall thickness. Seal the surface: Use an epoxy adhesive (such as Rhino Carbon Fiber's Fast Curing Epoxy) to seal over the surface ports and exposed cracks. The paste cures in about 20 to 45 minutes to provide a surface seal with excellent bond characteristics that holds up under injection pressures. The entire exposed crack is covered with the paste, leaving only the port holes uncovered. Inject the crack: Begin injecting at the lowest port on the wall and continue until the epoxy or urethane begins to ooze out of the port above it. That's the visual sign that the crack has been filled to that level. Plug the first port with the cap provided and move up to the next port, repeating this procedure until the entire crack has been filled with epoxy or urethane. Let the compression spring on the dispensing tool push the material into the crack using slow, constant pressure. This will reduce the possibility of leaks or blow-outs and allow time for the repair material to fully penetrate the crack. Remove the ports: Allow 24 to 48 hours at room temperature for the epoxy or polyurethane to cure and penetrate into the cracks. The injection ports can then be removed by striking them with a trowel or hammer. If appearance is an issue, the epoxy surface seal can be chipped away or ground off with a sanding disk. 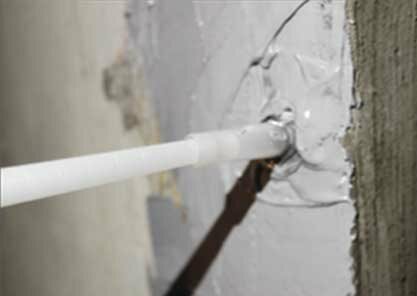 Another option is to use a surface seal that can simply be peeled off the wall after the repair is fully cured.